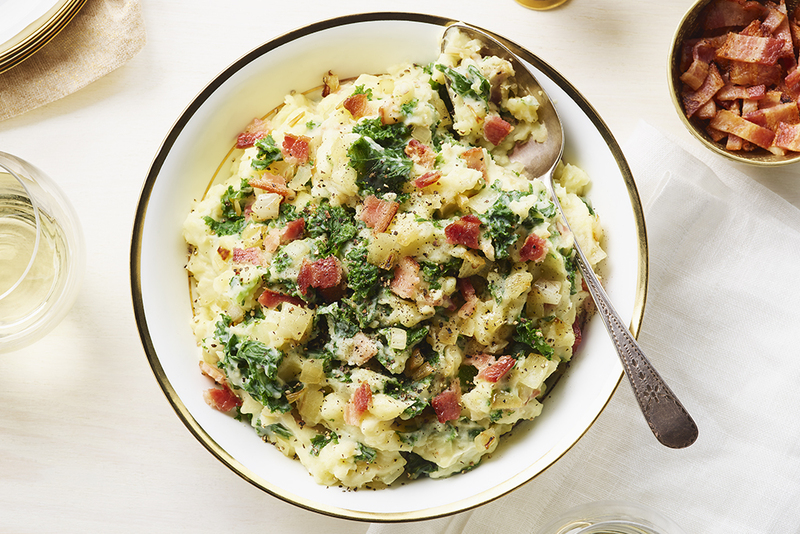 This fresh take on a classic Irish dish called “Colcannon” combines creamy, mashed potatoes with tender greens and crisp bacon. It makes an ultimate side dish for any big family dinner. Cook potatoes in a large saucepan of salted, boiling water, 20 minutes until fork tender. Drain well. Return to pan; cover and set aside to keep warm. Meanwhile, fry bacon in large non-stick skillet over medium-high heat, stirring often, 6 minutes until crisp. With slotted spoon, remove bacon to paper towels to drain. Discard all but 1 tbsp (15 mL) of the fat in pan. Reduce heat to medium. Cook onions until softened, about 5 minutes. Add garlic and cook, stirring, for 1 minute. Add kale; cook, stirring, for 5 minutes until kale is wilted and tender. Add soup and sour cream to pan. Cook until hot but not boiling, stirring constantly; remove from heat. 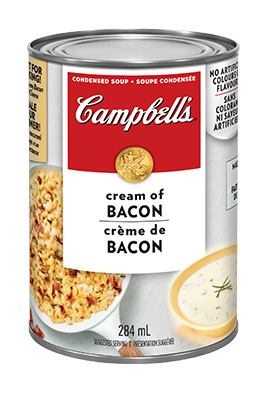 To make ahead, prepare recipe as directed, reserving bacon garnish. Refrigerate mixture and reserved bacon in separate airtight containers for up to 24 hours. Reheat in microwave, stirring two or three times, until hot. Transfer to serving dish. Reheat the bacon garnish in microwave on high for 5 to 10 seconds. Sprinkle over top. I loved the creamy mash with kale and bacon!